Flexi Slide vinyl application fluid helps to lay down self adhesive vinyl onto the substrate with out air bubbles. 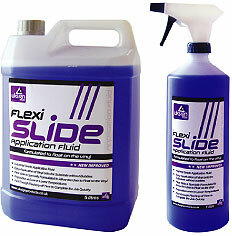 Flexi slide application fluid is specially formulated to allow the user to float the vinyl into position, even in lower temperatures with a fast enough flashing off time to complete the job quickly. Flexi slide will assist on large projects such as flood coating large panels with vinyl, for advice and information on how to use our flexi slide application fluid for vinyl please contact us at sales@uksignproducts.co.uk. Please note not compatible with vinyls that have a water based adhesive. Please contact your vinyl supplier if you are unsure of which type of adhesive your vinyl has. When ordering chemicals, please note we are only able to ship in multiples of 4 maximum per box. Should you require more than 4 in one order then we will ship in more than one box. Each box will incur the standard carriage charge. You can order your FlexiPrep Vinyl Adhesive Remover and FlexiClean Vinyl Substrate Preparation Fluid in our Sign Makers Chemicals section.